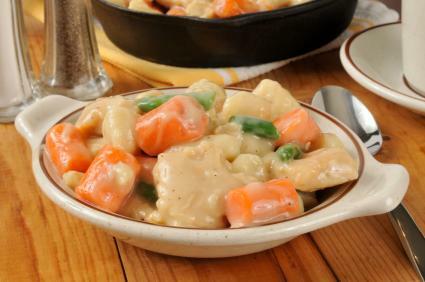 When it comes to comfort foods, you just can't beat a dish of chicken and dumplings. There are numerous variations of this dish, but at its heart, it's a savory chicken stew that usually has a few vegetables, and either flat or fluffy dumplings to soak up that thick, delicious broth. This recipe makes a fairly traditional version of chicken and dumplings that will serve about 4 to 5 people. In a large bowl, sprinkle the half cup flour over the chicken chunks and toss to coat them. In a Dutch oven over medium-high heat, heat two tablespoons of the olive oil. Add the chicken to the Dutch oven, and cook it until it just begins to brown, about four minutes. Transfer the chicken to a dish so the Dutch oven is free for the next step. Reduce the heat to medium, and add one more tablespoon of olive oil to the pot. Stir in the vegetables and all three seasonings. Put the lid on the Dutch oven, and let the vegetables cook about six to eight minutes or until they're tender. Stir occasionally to keep the vegetables from sticking to the bottom. Remove the lid, add the two tablespoons of flour to the pot, and stir. Once the vegetables are coated with the flour, return the chicken to the pot, slowly pour in the broth, and bring the pot to a simmer, stirring frequently. While the stew is simmering, start the dumplings. Stir the wheat and all-purpose flours, baking soda, and half teaspoon of salt together in a bowl, and then pour in the buttermilk. Stir just until the liquid is absorbed, or your dumplings may turn out tough. Gently drop rounded tablespoons of dough on the stew, working your way around the edge of the pot, and then filling in the center. Reduce the heat slightly so the stew simmers lightly, and put the lid back on the Dutch oven. Let the dumplings cook for 15 to 17 minutes, and then check them. They should look fluffy and not feel sticky. Remove the Dutch oven from the heat, and let the chicken and dumplings rest for about 10 minutes to cool down a little. Use a large serving spoon to ladle individual portions into bowls, and serve. There's more than one way to make your dumplings. Try one of these variations with the recipe above. Open one or two rolls of buttermilk biscuit dough, depending on how many dumplings you want. Lay the individual dough pieces on top of the simmering stew mix. 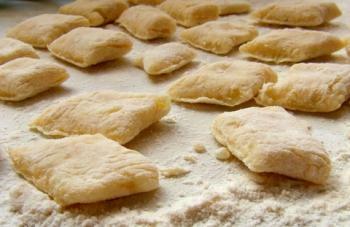 Cook the biscuits/dumplings until they are fluffy and no longer doughy, about 10 to 12 minutes. These are the rectangular dumplings that are almost like a really thick noodle. They take a bit of work to produce, but they're certainly worth it. In a large bowl, add the flour, baking powder, and salt, and stir with a fork to combine. Using two butter knives, cut the butter into the flour mix until the mix looks crumbly. Add in the milk, and stir with a wooden spoon until the dough forms a ball. Turn the dough out onto a heavily floured pastry board, and gently pat it into a mound with floured hands. Using a floured rolling pin, roll out the dough into an approximately 1/4-inch thick rectangle. Dip a pizza cutter in flour, and cut the dough into approximately 1 x 2-inch pieces. Bring a large pot of salted water to a boil, and then use a spatula to lift the dumplings from the pastry board, one at a time, and gently drop them into the water. Let them cook about 10 to 12 minutes, and then you can scoop them out with a slotted spoon and add them to the chicken stew mix from the recipe above. Serve stew and dumplings immediately. You can buy packaged mixes of chicken and dumplings at the grocery store, but they absolutely don't compare to the dish you can make yourself at home. The preparation is a little labor intensive, but the result is so wonderfully flavorful that you may never resort to a box mix again.